This Timeline is an ongoing project to chronicle the History of the Ballachulish area. If you notice any errors or omissions, please contact Rob Malpas at rileyrob@btinternet.com. Thank You. Photos on this page are copyright Rob Malpas unless otherwise stated. Work to build the pavilion in the Jubilee Park started in late summer and was completed over the winter. The purpose built pavilion has changing facilities and a kitchen area on the ground floor with a committee room and a community council chamber upstairs. The New Abbeyfield Care Home opened in Ballachulish, providing room for around 20 residents and also with 12 sheltered flats attached around the courtyard. The building has subsequently been modified to increase the number of residents accommodated to 28 with 9 sheltered flats. The new House was partially built in the gardens of the old, which stood in the courtyard area, now the sheltered flats and car park. 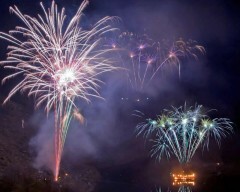 The first of Ballachulish’s now famous annual Fireworks shows took place in the East Quarry. This event has grown bigger and better over the last 10 years and enjoys strong support from the local area, with 2015 being a 10th Anniversary spectacular. Highland Country Buses are sold to Stagecoach. The buses are quickly rebranded as ‘The Fort Link’ with the usual orange white and blue livery of Stagecoach. This marks the end of independent local operators running the main bus services in the Ballachulish area, although Shiel Buses of Acharacle and West Coast Motors from Oban and Campbeltown operate some of the Citylink services passing through Ballachulish. A partnership including Sustrans, Transport Scotland, Highland Council and Argyll & Bute Council reopened the old railway line from Kentallen to the old ferry station near the bridge in late summer 2008 as a newly surfaced Cycle Route, part of NCN78 the Campbeltown to Inverness Route. Other sections of the old line, through Appin and Creagan were also being converted to be a cycle track. Redecorated throughout including thorough refurbishment of toilets. A further extension of the cycle track in 2012, alongside the A82, brought it through Ballachulish and into Glencoe. As the A82 had already taken over much of the old railway line, this section is largely just a roadside pavement. At the same time, the route is also taken across the Ballachulish Bridge and up to the old ferry road junction. The Jubilee Park was closed for much of the summer whilst it underwent major works to improve the drainage. Despite previous attempts to solve the flooding problems in the field being less than successful in the longer term, the latest works have so far proved to have substantially reduced flooding. The 4th Lochaber (Ballachulish) Scout group was reformed with a Halloween Party. This is at least the third incarnation of the group, which had previously operated in the 1980s and also for a period in the 1950s or 60s. Three years later, the group is still going strong, having maintained a membership of around 60 kids, drawn from the whole of South Lochaber and Appin over time. This makes it one of the larger groups in the Highlands. The former engine shed at Ballachulish was demolished during the summer as it had become unsafe. For many years the building had been used as a garage by the Chisholms, before lying empty after they moved to the West Quarry. The demolition means that there is no physical record of the goods yard remaining to be seen, although the station building survives as the village surgery, and there are also some concrete retaining walls at the back of Station House. In the same year, the former Ballachulish bus garage for MacBraynes, although long since used for other purposes, was taken down in preparation for the construction of two new houses. 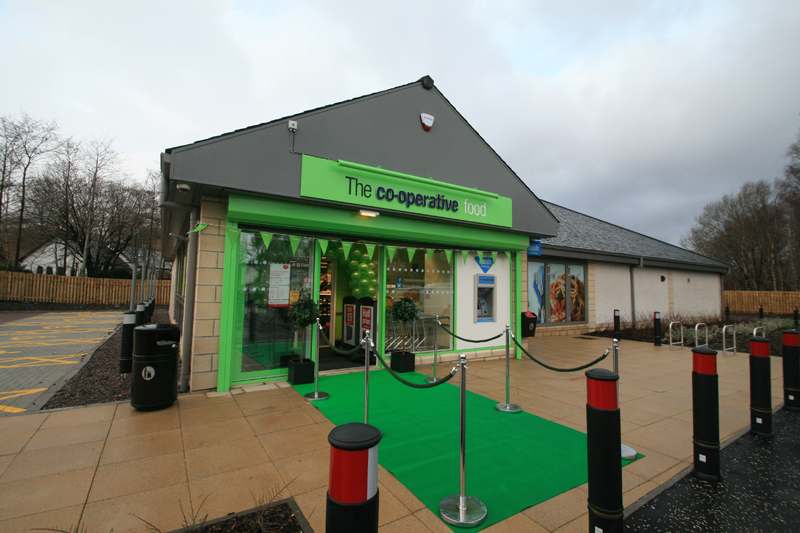 The long promised new Co-op small Supermarket is finally opened on a site at the back of the main car park in the old Station Goods Yard. After several years of dashed hopes and false starts, construction of the store had started the previous summer, and despite a couple of further minor delays opened prior to the beginning of the main summer season. In its first year the store exceeded expectations and has proved to be largely popular with local residents and tourists alike, proving the value of the over £1 million investment. This brought to an end over a century of retailing at Barrs Stores. Of this traffic, roughly 2000 vehicles come up the Oban road with around 4000 passing Ballachulish. After the Kinlochleven road junction in North Ballachulish, the volume increases again to over 7500 vehicles, and then nearly 9000 once the Corran Ferry is passed. The Ballachulish Bridge deck, road surface and pavements are replaced in the autumn of 2014, with the bridge kept open throughout with single lane running and traffic lights. A recent ballot of the community saw a majority in favour of progressing with the planned River Laroch Hydro Scheme as a community project. Work is now progressing with this project, a project leader has been appointed and it is hoped that the scheme will be running and generating electricity by 2018. The Highland Council start this project which will see the refurbishment of the Ballachulish Arch, new interpretation panels and improved pathways in and around the quarry area, along with a project to bring information and community memories together as a record for future generations. Work is due to begin in October, and be completed in spring 2016. The population of Ballachulish Community Council area, including Glenachulish, Lettermore and South Ballachulish is estimated at 716 people in 363 properties. Of these people, 18% are under 18 and 34% are over 65, including the 36 residents of Abbeyfield. The Community Council and Community Association joined forces this year with other groups in the village to try and make Ballachulish a nicer and brighter place to live. Over a series of weekends from April until October, a total of well over 100 volunteers helped to cut back brambles and weeds, prune bushes and thin out trees around the village and in the quarry. A number of planters were also bought, and older ones resited to make a more colourful and impactful display throughout the summer. All of the clubs, groups and other voluntary organisations in the village were invited to help draw up a 5 year Community Action Plan for Ballachulish. This will enable us to plan the future for our community and try to ensure that funding and grants are sourced for projects without overlapping or conflicting with others. The process is ongoing, and hoped to be completed, after full consultation, in the late spring of 2016. Ballachulish Bridge is (nearly) 40 years old. 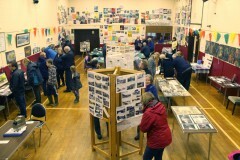 The communities around the bridge hold an exhibition in Ballachulish Village Hall to celebrate 40 years since the opening of the bridge, and so the final sailing of the ferries. The exhibition also remembers the forthcoming 50th anniversary of the closure of the Railway Line. 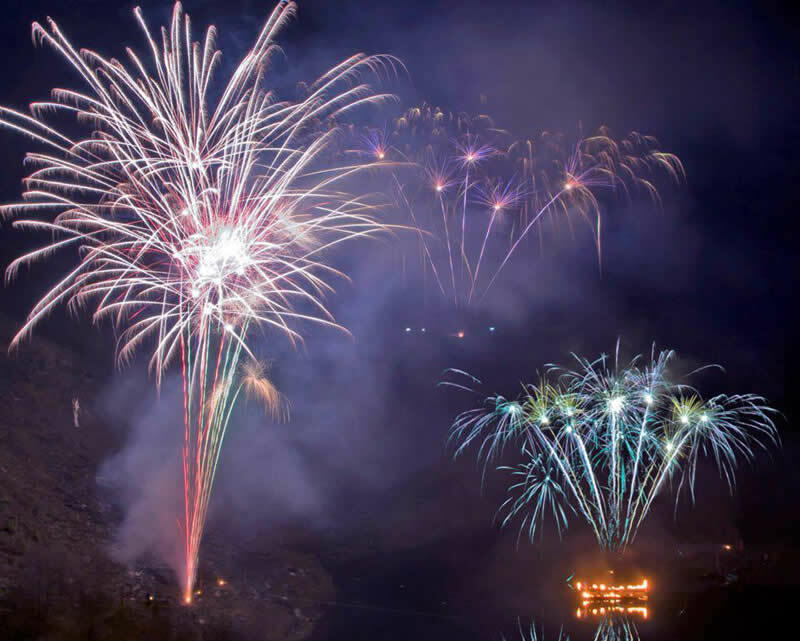 Coincidentally it is also 30 years since the village hall first opened its doors, and the 10thanniversary of the now famous Ballachulish Fireworks display. Finally, it is 60 years since the quarries closed. Base for other community events, including village Spring Clean. All of which proves that the foresight of that first committee over 34 years ago has proved to be a sound investment and helped to bring our community together in a variety of ways over the last 30 years. It may be 50 years since the railway closed and 40 years since the ferries stopped running, but the infrastructure still plays an important part in the life of the local community. The most obvious aspect of this is that Ballachulish’s old station building is now the Doctors Surgery. Beyond this, much of the old trackbed through the village has been built on with new houses, but from the village to the bridge the line of the railway enabled substantial road improvements in the 1970s and 80s. Continuing westwards, from Ballachulish Ferry Station round to Kentallen most of the line has been reopened as a cycle track, used by walkers and cyclists for leisure purposes, as well as a safe route away from the busy road between the various villages and houses it passes. The infrastructure left behind by the ferry is obviously much less, but it is still in use. The queuing spaces on either shore are now parking, that on the south regularly filled by cars from the Ballachulish Hotel. The south slipway is also used by local business iPowerboat for boat trips, with both slipways open to use by kayakers and canoes as well as for the launching of larger boats. History doesn’t stop at a given date, and so this timeline will continue to be updated as we progress beyond the Anniversaries Exhibition held in late 2015 which caused this timeline to be created. After around 30 years of a physical presence in the village, the Ballachulish branch of the Royal Bank of Scotland closes. The branch is replaced by a mobile bank, which still calls in the village two days a week, and also serves the surrounding villages. The communities see it as a mixed blessing. After several months hard work, with the school kids and Scouts helping to deliver and collect surveys, the highly anticipated results of the Action Plan are released. An event on the Saturday enables members of the community to come and see the results and vote on their favourite ideas, as well as allowing some of the local groups to showcase what they do in the area. Refreshments and entertainment are also laid on for a fun packed family day. The old Barrs Stores re-opened just over 2 years after the Co-op moved out. It has been given a new lease of life by new owner Karl Griffen as a Chip Shop Takeaway, to complement the other businesses in the village. It means that over 25 years on, the chip shop which once operated from what is now the Laroch Bar has reopened on the other side of the wall! Through Spring 2016 pavement widening and improvements continued along the A82 from the Ballachulish Bridge to the Corran Ferry to enable this section of the NCN78 Campbeltown – Inverness cycle route to open. The new path is mostly an improvement on the often narrow pavement that existed previously, but there are still a few pinch points where garden walls and bridge parapets have prevented the path being widened. A footbridge over the River Righ at Inchree is due to be installed in 2017 to complete the route, which continues along the A861 across the Corran Ferry to the Treslaig ferry into Fort William. 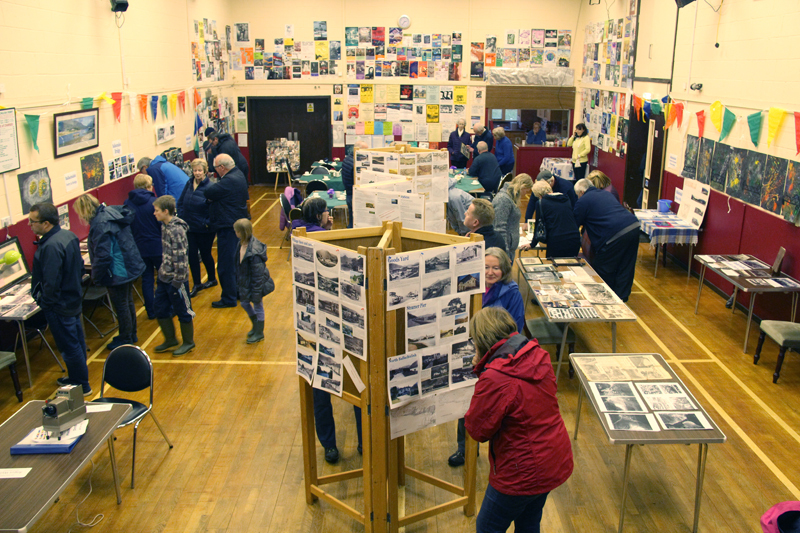 Just under a year after the Anniversaries Exhibition, the Village Hall played host to a Ballachulish Heritage Exhibition as part of the local Autumn Festival. With some familiar exhibits and many new ones, locals and visitors alike were able to once more discover some of the amazing history outlined above and more besides.